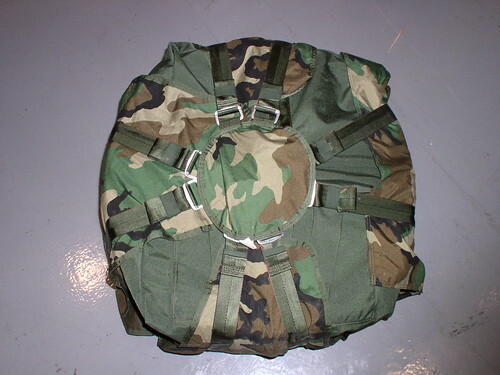 Montague Corporation states that their Paratrooper can be air dropped and be ready for action. As a Paratrooper myself, I was more than happy to put it to the test. A few days ago, my Unit conducted an Airborne Operation. It was the perfect opportunity to jump the Paratrooper. But before the jump was to take place I had to rig up the Paratrooper in order for it to be dropped. I used an Air Pack to rig up the Paratrooper. It was one of the few containers that I had available to fit the whole bike. 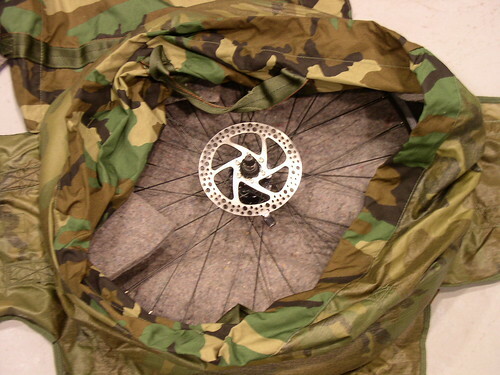 Here you could see the front tire being placed inside the bag. A lot of padding was used to protect the bike. The rest of the bike had to be placed inside a HALO kit bag. This was done so that none of the bike would be exposed decreasing the chance of snagging any part of the aircraft upon exit. The handle bars and pedals were removed in order to keep a uniform shape of the Drop Bag. Montague offers folding pedals as an accessory that could be used to keep from having to remove the pedals. 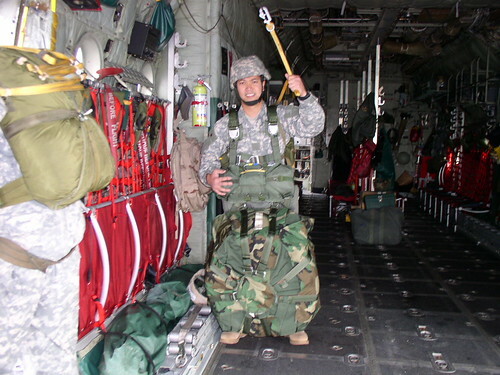 Above is what the Paratrooper looks after being completely rigged to be air dropped. Every part of the Mountain Bike is included so that it could be used on the drop zone. This was taken on the way to the C-130 Hercules just before station time. Inside the C-130 just before the jump. Being in a unique Unit, a grand total of five static line jumpers owned the entire aircraft that day. For those of you who jump and are usually packed inside the bird like a can of sardines, stop drooling. Don’t worry; I’ve had my fair share of those jumps as well. 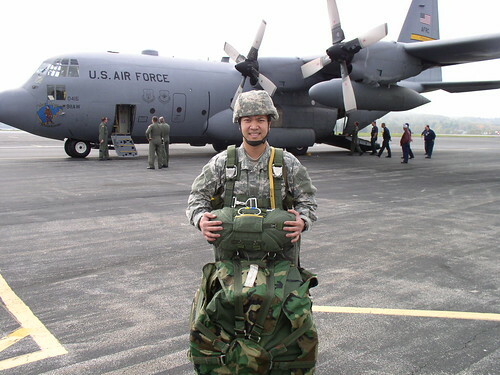 This was taken on the drop zone after a spectacular jump. My landing could use some improvement. But the way I figure is, any jump you could walk away from is a great jump. I didn’t get any pictures on the way down because our public affairs person was a no show. I plan on jumping the Paratrooper once again. Next time I’ll just leave my camera on the ground for someone to take pictures from the ground up. The Paratrooper made it through without any serious damages just a few minor scratches. Not bad considering the fact that it was just dropped 1,250 ft above ground level. Wow. But aren’t you supposed make the jump while you’re on the bike and simply ride away when you land? Isn’t that what everyone does? Sorry eddy, but this jump is just a bit higher than your regular side walk. Taking Commuting by Bike to a ‘higher level’. We have another facemelter! This is a good practice, I think, ensuring that a bike lives up to it’s name. A Dahon Boardwalk, for example, would have to be ridden on a boardwalk. A Bianchi Pista should be tested on a track. A GT Avalanche should take a rider safely down a mountain during a massive snowslide, a Surly Steamroller should be tested on its ability to smooth asphalt, and a Jamis Sputnik should be capable of orbiting the earth in a period of 96.2 minutes at a height of 250 km. mmmm.. I have a K2 ‘Lithium’ and a Kona ‘Smoke’. That’ll really be taking CbB to a “higher level,” eh Moe? come and see my hummer bike. Is there any chance for a civilian to get a backpack like the one you used? 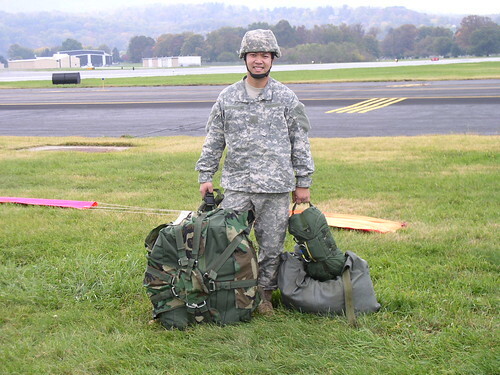 I would love to be able to transport my Paratrooper in a backpack!